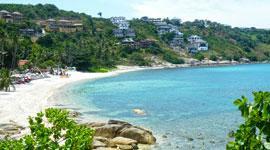 The Ang Thong National Marine Park is located 30 kilometers north-west of Koh Samui in the Gulf of Thailand. 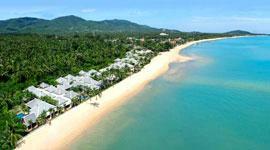 It consist of approximately 40 small scattered islands which forms part of the Koh Samui archipelago. Daily boat trips to the park is on offer leaving from from Nathon or Maenam Pier on Samui or Thong sala pier on Phangan at approximately 08:30 in the morning. 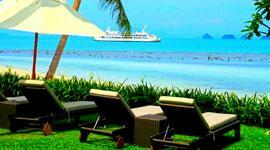 Bookings can be done via your hotel or directly with one of many tourist centers on the island. You will have a choice of traveling either by speed boat, which sometimes can be a bumpy ride, or high speed catamaran, which is quite comfortable. The boat trip to the park takes approximately one hour. Most of the 40 islands are uninhabited with the exception of one which is home to a small fishing community comprising of approximately 200 families making a living off what the sea provides. The site that awaits you is nothing short of spectacular which makes it impossible to capture its exotic beauty with written information and images. Snorkeling will be on the agenda allowing visitors to swim among colourful coral and tropical fish species. When in the water, take a hand full of bread with you and immediately have tropical fish swarming around you for a bite. The day trip to Ang Thong, which lasts until approximately 05:00 pm, includes a lunch often served on the small island housing the fishing community earlier spoken of. The setting is quite original and the food is great. 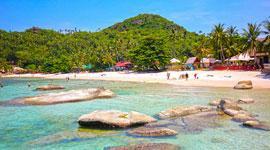 Another surprise on this trip is a stop at the small island of Mae Koh located in the marine park. This allows you to climb to a view point displaying the famous blue lagoon in the middle of the island. The caves, crevices and limestone cliffs, for which time is allowed to explore by kayak, is the stuff most people only see on post cards. Another stop at one of the islands allows time to do whatever you feel like. The beaches on these islands are pure white powder, the water almost too warm and clear as glass. During the last stop you may snorkel along the limestone cliffs, kayak, play volleyball, swim or soak the sun on one of the most beautiful little beaches many of us will ever lay eyes on. The boat leaves the park at approximately 04:00 pm heading back to Koh Samui. Be sure to take your camera along, this is one excursion which will allow you perfect photo opportunities.